Self-striping sock yarn, that is. It’s the combination of stripes, without sewing in ends. It’s the colours, the more the better. It’s sock yarn, so it’s virtually blameless and guilt free. Go on, I know you want some too. As a community service I will reveal that this is from Fab Funky Fibres from Etsy. I have no association, but really after showing you this, it would be cruel of me NOT to tell you where you can get some. I’ve just passed the heel, and I’ve been swayed by Louisa’s suggestion (from Richmond Knitters) to do a solid colour for the heel, so I’ve chosen to do it in black Patonyle, the most reliable sock yarn on the face of this earth. And it looks great (in my opinion)! 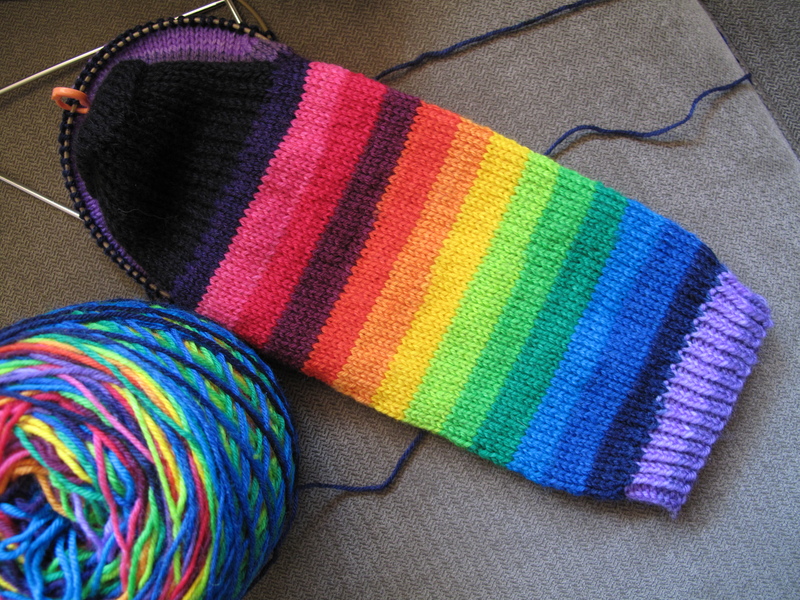 If you have any secret sources for amazing self-striping yarn, I’d love to hear about it!